On Thursday, Queens Community Board 3 voted to support a more sophisticated way to price on-street parking on commercial streets [PDF], supporting DOT’s proposal to bring the PARK Smart program to Jackson Heights. PARK Smart can be the most effective traffic-reduction policy in DOT’s toolkit. In some NYC neighborhoods, drivers cruising for parking constitute nearly half of all traffic. PARK Smart adjusts meter rates and extends hours in an effort to align the price of parking with demand, which makes it easier for drivers to find a spot and cuts down on cruising and double parking. Jackson Heights will be the first neighborhood in Queens — and one of only three in the city — to participate in PARK Smart. The program’s specifics vary in each neighborhood. In Jackson Heights, the PARK Smart pilot will adjust metering on blocks of 37th Avenue, 74th Street, 82nd Street, Broadway, Roosevelt Avenue, 37th Road and Roosevelt Avenue. Meters on 74th Street and Roosevelt Avenue had a one hour limit; under the new policy drivers will be able park for up to two hours. Along one block of 74th Street, meters that turned off at 7 p.m. are now extended until 10 p.m. 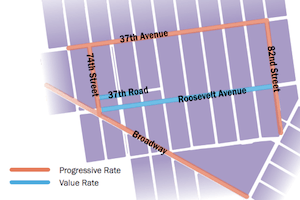 While the extension of meter hours will cut down on cruising in the evenings, the pricing in Jackson Heights is not going to change for stays under an hour, limiting the potential to improve parking availability and reduce traffic before 7 p.m.
For drivers who stay longer than 60 minutes, there are now two types of meters in the neighborhood. This is where the new pricing structure comes in. Meters on “progressive rate” streets will charge an increasing fee to discourage long-term parking and keep spaces available for shoppers on major commercial corridors. Meters on “value rate” streets will charge 50 cents for each additional 30 minutes after the first hour — the same rate as the first hour. If someone wants to park for two hours, a progressive rate meter would cost $4, while a value rate meter would cost half that. The changes will be phased in over the winter, according to DOT, and the pilot is expected to last for about one year. It looks like this initial phase could produce data regarding the difference between “progressive” meters and “value” meters that may inform future PARK Smart phases in Jackson Heights. The community board asked DOT to investigate PARK Smart as part of a larger neighborhood transportation plan in June 2011. Over the past 17 months, DOT has worked with CB 3 to refine its parking meter proposals, and the agency presented its plan to the full board in September before last week’s approval. In addition to PARK Smart meter changes, the area has also received changes to commercial parking and delivery zones. “Early Morning Delivery Zones” are being established to provide loading space before the meters turn on at 10 a.m., and “Paid Commercial Parking Zones” reserve daytime metered spaces for commercial uses. The loading zone changes will be complete in the next couple weeks, according to DOT. Jackson Heights joins Park Slope and Greenwich Village as a PARK Smart neighborhood. To align meter prices with demand, on-street parking now costs up to $2 an hour in Park Slope and up to $5 an hour in Greenwich Village at peak times. DOT had begun a PARK Smart pilot on Madison Avenue and East 86th Street, but after the initial results showed no improvements in parking availability or turnover rates, Manhattan Community Board 8 voted against DOT’s request to expand the pilot, and the experiment came to a halt. The program has generated interest in other neighborhoods, too. Some residents and merchants near the Barclays Center have expressed support for bringing the PARK Smart program to their area. A DOT spokesperson says that the agency is also in discussions to bring a PARK Smart pilot to the Atlantic Avenue business district in Brooklyn. DOT will measure the program’s effectiveness in Jackson Heights by keeping track of parking space turnover and availability, as well as surveying merchants, residents and shoppers. At the end of this year-long pilot, Community Board 3 will decide whether to make the changes permanent. Is there any data that this actually works? DOT only says the pilot program was “successfull” but I don’t see any concrete numbers.